Two years ago, Jessica Leigh Clark-Bojin didn’t even know how to bake, but today she is widely regarded as the world’s most talented pie maker. And, believe it or not, she’s entirely self taught. Jessica Leigh Clark-Bojin’s amazing journey into the world of elaborate pies began a couple of years ago, as a New Year’s resolution to cut down on sugar. Pies just seemed like the safest way to satisfy her dessert cravings, but there was just one problem – she didn’t know anything about baking, or cooking in general for that matter. So she dedicated six months to developing her baking skills, and it paid off big-time. These days, Clark-Bojin’s fabulous pies are all the rage on social media and she’s able to make a living by selling how-to guides to like-minded pie enthusiasts who want to bake their own edible works of art. “I couldn’t crack an egg. I was shooed out at family gatherings, I had no kitchen experience whatsoever,” the former filmmaker described her cooking experience before she got into pie making. “I was not a kitchen person by any stretch of the imagination, I’ve literally burned ichiban,” she recently told CBC Arts. So how does someone with virtually no cooking skills become a pie master? Well, in Jessica’s case, it had a lot to do with her tendency to “fancy up” everything she makes. When she attempted her first pie, two years ago, the classic apple-cheddar dessert just didn’t seem challenging or exciting enough for her, so she shaped the top dough layer in as a dragon instead. It turned out better than she had expected, so she proudly posted a few of photos of it online. Those first pics got a lot more media attention than the amateur pie maker ever anticipated, including a mention on Bored Panda. It was humbling, but also a little strange. She thought ‘This is strange. Surely other people have done things like this before,’ but a Google search yielded nothing similar to what she had created. That was when she decided it was time for pies to get the recognition they deserved. Soon after her initial success, Jessica Leigh Clark-Bojin set up her now famous blog – Pies Are Awesome – and also started posting photos of her amazing pies on social media, under the name @ThePieous. Today, Jessica has thousands of adoring fans on Instagram and Facebook, her work has been featured on popular food art sites, and she can support herself by doing what she loves and teaching others the secrets to baking glorious pies. Clark-Bojin says that she doesn’t want to be just a “snotty pie artist”, but also show the world that “not only can pies go head-to-head against the poshest wedding cakes and fancy-pants desserts on the most discerning buffet tables of the world, but that they can be fun and easy to pull off too”. Truthfully, she makes that sound way easier than it actually is. If you’ve ever worked with pie crust before, you already know that it’s way harder to mold into intricate shapes than say fondant icing. A design may look pretty and detailed in dough form, but 30 minutes in the oven can change its look quite a bit. But that only makes @ThePieous elaborate pies that much more impressive. 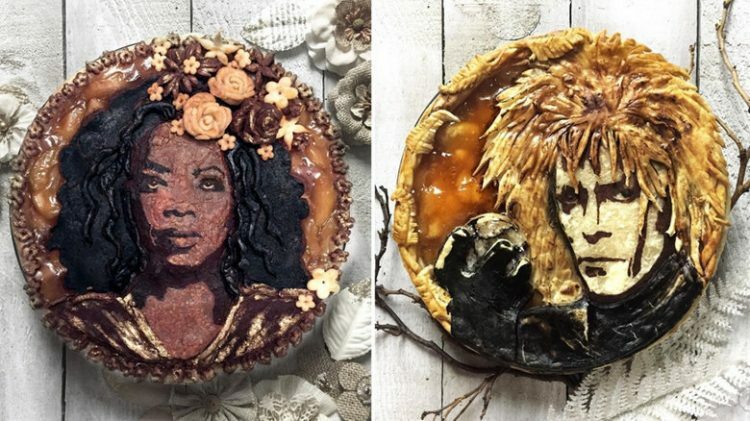 So far, Jessica has tried her hand at various styles of pies, from desserts shaped as popular Disney Princesses filled with fruity goodness, to pop-art inspired pies featuring portraits of celebrities and even ‘piescrapers’, which, as the name suggests, are molded and baked vertically. Oh, I almost forgot the glow-in-the-dark dough she developed herself. It seems there’s nothing this amazing food artist can’t do, and we can’t wait to see what she comes up with next. If you’re into pies that look too good to eat, you should definitely keep an eye on @ThePieous.